Recently a campaign by a Georgia anti-abortion group featured billboards that depicted a black baby and the text “Black children are an endangered species.” [See this Associated Press article.] As you may imagine, the billboards were instantly controversial and provoked heated discussion among abortion-rights and anti-abortion activists. 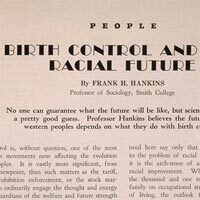 Motivated by the desire to promote an agenda, the group that initiated the campaign argued that abortion is linked to race, and has been since the founding of Planned Parenthood by Margaret Sanger in the early 1900s. Others say they are trying to bait African Americans into opposing abortion through shame and fear.